Jacques Heim, Artistic Director for Diavolo, describes the Los Angeles-based company's approach to dance as "architecture in motion." At each event, arcs, ramps, blocks, and domes propel performers into motion. 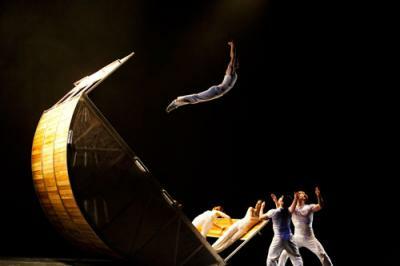 Diavolo offers a unique combination of aerobics, ballet, and martial arts, as dancers reckon with the simple, powerful structures that illuminate the stage. Iconic forms and motions are emphasized, as the company uses gravity and symmetry to generate drama. The performances feel mechanical and expressive simultaneously, adding energy and innovation to the familiar ways we all navigate an industrialized world. Heim once worked as a choreographer with Cirque du Soleil, which provides a useful point of comparison. Diavolo's performances are equally spirited and unconventional, but there's less of an emphasis on theatricality. Don't expect animal costumes or complicated pyrotechnics. The aesthetic is modern and minimal – you'll feel more like you're in an art gallery than at an Italian carnival. Though Diavolo's style is contemporary, you won't find them inaccessible. The stripped-down aesthetic keeps the focus on the performers and their athleticism. As they contend with a variety of architectural forms, the strength, fragility, and flexibility of the human form takes center stage. The stirring music can be fluid or bombastic, but never grating or overpowering. Expect engagement, not bewilderment.